The record for the world’s worst traffic jam belongs to Beijing’s gridlock. For 12 days in August 2010, cars could not escape 62 miles of freeway. This example, alongside the U.N.’s prediction that by 2030 two-thirds of the world’s population will reside in densely packed megacities, reinforces a real urgency to alleviate the pressures and impact of overcrowding. The concept of “smart cities,” which employs Internet of Things (IoT) technologies such as connected sensors, meters and lights to collect and analyze data to improve public infrastructure and services, holds the promise to dramatically change the way citizens live, work and get around. But is there a way to tangibly measure these benefits? Yes, there is. 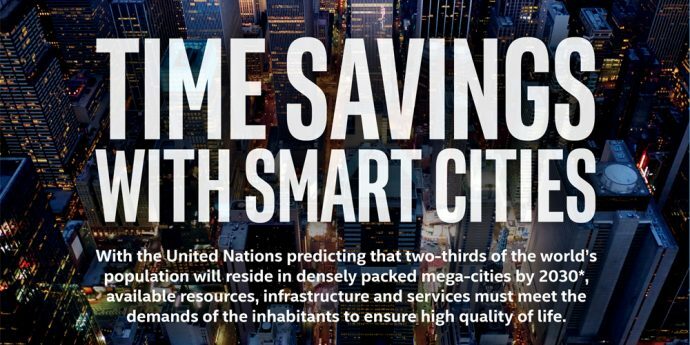 An Intel-sponsored study by Juniper Research estimates that smart cities have the potential to “give back” a remarkable 125 hours to every resident every year. Additionally, the study ranks the top 20 smart cities worldwide across four key areas: mobility, health care, public safety and productivity, and reveals how these cities deliver positive outcomes for increased time savings and productivity, increases in health and overall quality of life, and a safer environment. The study found that Chicago, London, New York, San Francisco and Singapore, are the world’s leading cities integrating IoT technologies and connected services. These cities stand out because of their cohesive efforts to connect city municipalities, businesses and their citizens to address a growing need to improve “livability” – specifically around mobility (San Francisco and Singapore), public safety (Chicago, New York and Singapore), health care (London and Singapore), and productivity (Chicago, London and Singapore) – as they transition to a smarter, more connected environment. Many of the IoT technologies identified in the study – including mobility, health and public safety solutions – are already being deployed around the world. Mobility: The average peak-time vehicle speed in cities is a dismal 4 mph. This gridlock causes drivers to lose up to 70 hours per year. The study determined an integrated IoT-enabled infrastructure of intelligent traffic systems, safer roads, directed parking, frictionless toll and parking payments can give back up to 60 hours a year to drivers otherwise stuck in their cars. Health: The study found that smart cities with connected digital health services can play a significant role in creating efficiencies – saving citizens almost 10 hours a year – and even potential lifesaving benefits for both patients and caregivers. Examples such as wearable apps monitor blood pressure, pain tolerance and temperature to help people manage chronic conditions without hospitalization. “Telemedicine” enables contagious flu sufferers to avoid doctor’s offices with an examination via high-speed video link from the comfort of their home. Public Safety: Improvements in public safety can deliver substantial time benefits for smart city citizens – nearly 35 hours per year, according to the study. For instance, in Portland, Oregon, (No. 12 in the Juniper Smart Cities Index) and San Diego (No. 14), Intel joined GE* and AT&T* to deploy the Digital Infrastructure with Current, powered by GE’s CityIQ™*. This enables the cityscape to generate valuable data. Street lights transform into connected digital infrastructure beacons, monitoring the pulse of city life, which enable a range of local departments to be safer, cleaner and more efficient. Smart cities may be still in the early stages, but based on the activities the study highlights, which are being rapidly implemented worldwide, there’s every reason to believe these examples are just the beginning of what’s possible.